Discussion in 'General Political Discussion' started by Terral, Jul 1, 2008. Flight 77 never crashed into the Pentagon on 9/11 or any other day. Everyone here is encouraged to produce just one picture of Flight 77 crashed outside the Pentagon, inside the Pentagon or anywhere else, because none exist anywhere but in the minds of deluded men. The first place to begin is the 911research Website (here) where I encourage everyone to hit the &#8220;<< PREVIOUS&#8221; and &#8220;NEXT >>&#8221; buttons to review the evidence and make up your minds for yourselves. We are talking about a Boeing 757-200 Jetliner (pic) about 155 feet long, 125 feet wide with a massive tail section standing over four stories tall down to the tarmac and weighing in at a whopping 100 tons. 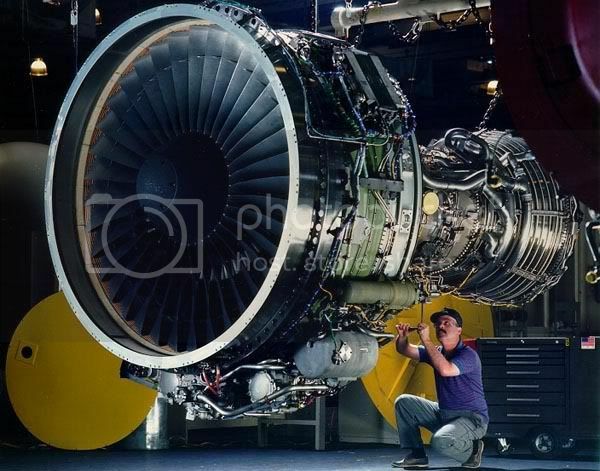 The massive Rolls-Royce engines (pic) weigh in at 6 tons each and are positioned approximately fifty feet apart under the massive wing sections (schematic). 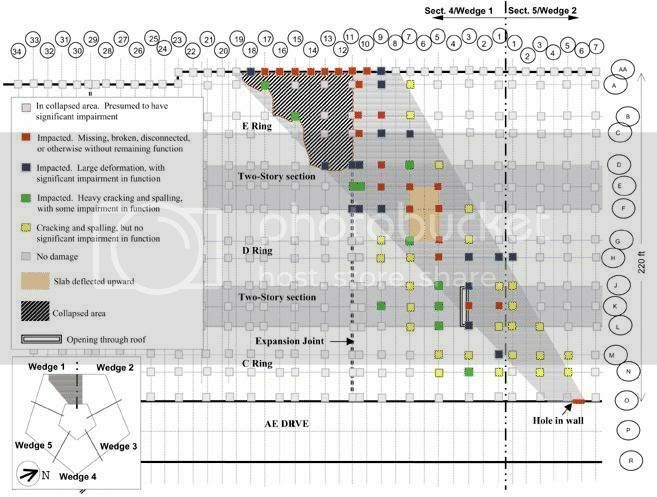 This picture (pic) highlights the &#8220;Plane Dimensions Relative To Impact&#8221; being 177 feet, because the Official Cover Story says AA77 crashed into the West Wedge Wall from the south on a 45-degree angle (like this) traveling at 530 miles per hour. 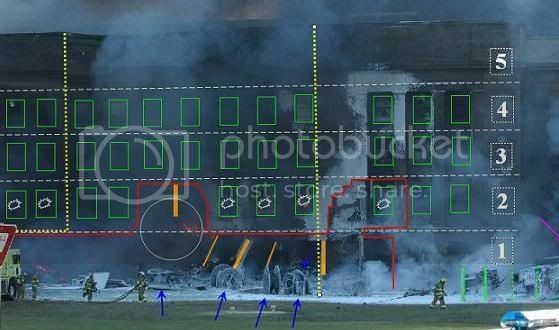 While the center of CL-14 (center of impact) was protected by the large cable spools (pic), the left side is the location of the green SUV parked directly in front of CL-8 exactly 59 feet from the center of impact. A man can stand on the roof of this green SUV and reach up to touch the elevation of the still-intact second story concrete slab running over to our still-intact second story windows. The Official Cover Story says a real 100-Ton Jetliner passed over the tops of this SUV and the cable spools &#8216;and&#8217; under the still-intact second story slab, which in NO WAY provides sufficient space to accommodate that kind of fantasy explanation. If we divided our 177 feet from the Impact Schematic in half (88.5 feet) and count nine columns north (to the left), that means we should have left-wing damage all the way over to CL-5!!! And yet, our updated damage diagram (pic = story) shows Column #9 and even Column #10 remaining intact. This means our actual first-floor damage on the left side runs from CL-14 to CL-10 spanning just about 40 feet. 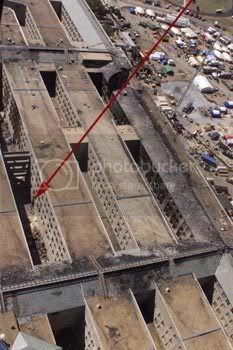 However (this is very important), we have real pictures of what a real Jetliner can do to even steel-framed buildings also taken on 9/11! Let the record show that Donald Rumsfeld told Parade Magazine on 9/12 that the Pentagon was struck by a missile! "It is a truth that a terrorist can attack any time, any place, using any technique and it's physically impossible to defend at every time and every place against every conceivable technique. Here we're talking about plastic knives and using an American Airlines flight filled with our citizens, and the missile to damage this building and similar (inaudible) that damaged the World Trade Center. The only way to deal with this problem is by taking the battle to the terrorists, wherever they are, and dealing with them." Now go back through all the evidence and realize that we have been looking at damage from a missile strike all along . . . (my thread). So where's the plane? Still up there waiting for clearance to land? Inquiring minds want to know. the same weapon used to blast the pentegon. Tractor beams caused the airliners to crash into the WTC, B ush is allowing the aliens to infiltrate the world in the guise of International world terrorism. Everyone grab your tinfoil hats, then you can see the aliens for what they really are. I found a cookbook, called How best to serve man!!!! If you have pictures of AA77 crashed ANYWHERE, then this is your opportunity to haul those out and show everyone here your version of the 911Truth. The Opening Post thesis is very clear and very simple that Flight 77 DID NOT crash into the Pentagon on 9/11 or any other day. Nobody is stepping up to the plate to take any swings at my OP hypothesis, because nobody has that kind of evidence. Where the plane is right now (link and link) is the topic of another discussion. The plane was blasted by space aliens using a photon pulse cannon, the same weapon used to blast the pentegon*. Tractor beams caused the airliners to crash into the WTC, Bush is allowing the aliens to infiltrate the world in the guise of International world terrorism. This Flight 77/Pentagon Topic has nothing to do with tractor beams, the WTC-7 case (my thread) or Senor Bushies involvement in planning and carrying out these 9/11 atrocities (Inside Job link) against We The People. This is a picture of the outer E-Ring wall where Senor Bush says a real 100-Ton Jetliner crashed less than 30 minutes earlier. Note the clean lawn and the E-Ring roof still standing and no entry hole large enough for any Jetliner and no Jetliner anywhere. This is another side view taken from the south that also shows NO PLACE to hide any 100-Ton Jetliner, when the massive tail section should have broken windows on the fourth floor. The person to ask Where is AA77?? ? is Senor Bush and his FBI/CIA/DoD Cronies running around telling Loyal Bushie LIES and deceiving everyone into believing their fantasies. Tinfoil what? If this is the Billnew, then one can just imagine the contributions from the old Bill. :0) If the Opening Post explanation seems dead wrong, then someone please post that picture of Flight 77 crashed into the above standing E-Ring wall! BTW, these 110 military people (starting with General Wesley Clark) all agree with me that we need a new 9/11 Investigation, because Senor Bushies story (pic) simply does not hold water. Hey! 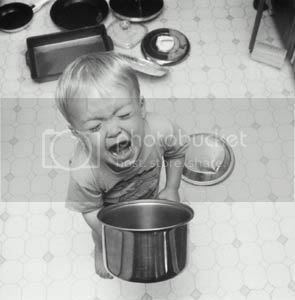 I found a picture (pic) of how my debating adversary is serving the members and readers of this fine CF.com Board! If all you can do is come out here to write one and two-sentence drivel and whine, then perhaps the best thing to do in the future is remain silent and appear wise (Proverbs) to someone . . . Keep up the nice work . . .
Whoah, a whole 110 military people? Amazing. Except there are over a million military personnel on active duty alone. Whoops, guess that number isn't so impressive anymore, huh? So, congrats on having a tiny minority of the mentally ill military population support you. Give yourself a pat on the back. Terral could you calculate the TNT equivalent of the explosive power of the amount of fuel on board at impact for us? 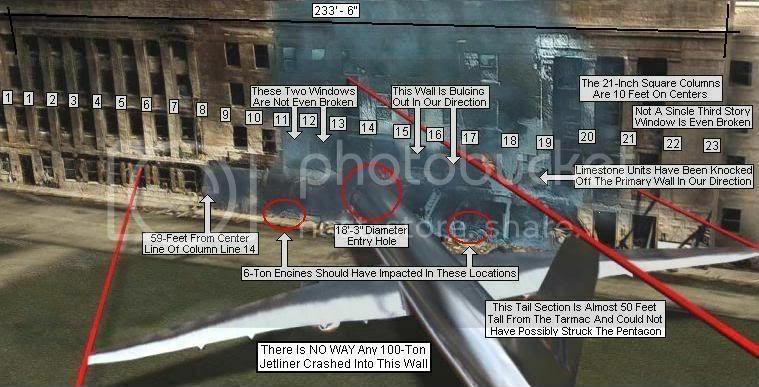 I do not require the testimony of one military witness to prove AA 77 DID NOT crash into the Pentagon, which is clearly evident by the lack of Jetliner debris in all the OP photographs. 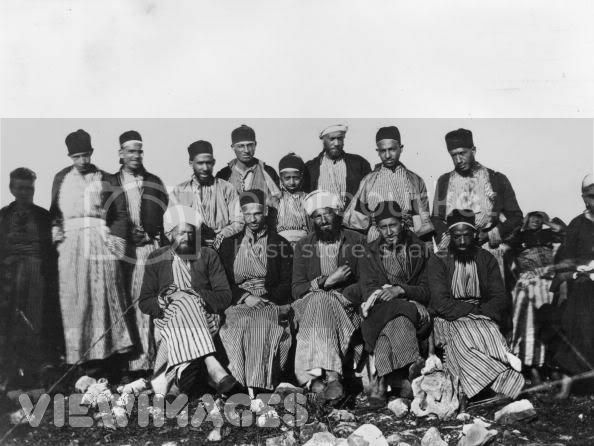 Also, these 110 military witnesses, including Major General Albert Subblebine (link) represent a mere sampling of military people advocating my OP hypothesis. Zap has NO CASE for Flight 77 crashing into the Pentagon or anywhere else and he really thinks Zap (heh) has greater credibility than all these military witnesses combined. :0) What a joke! The question remains about what evidence Zap has to disprove the OP hypothesis saying that AA77 DID NOT Crash Into The Pentagon? Two hundred words Terral: What were the events of 9/11. Not what you think didn't happen. Tell us in your own words, what you think did. Until you have an alternative theory that's more probably, all you're doing here is trolling. So this is the logic you are using. Lets say I told you my keys were on the end table. You look at see that the end table is empty, yet the keys must be on the end table until you have an alternative theory where my keys are. So the "keys on the end table" theory must be true until you can support a more probable theory where the keys are. 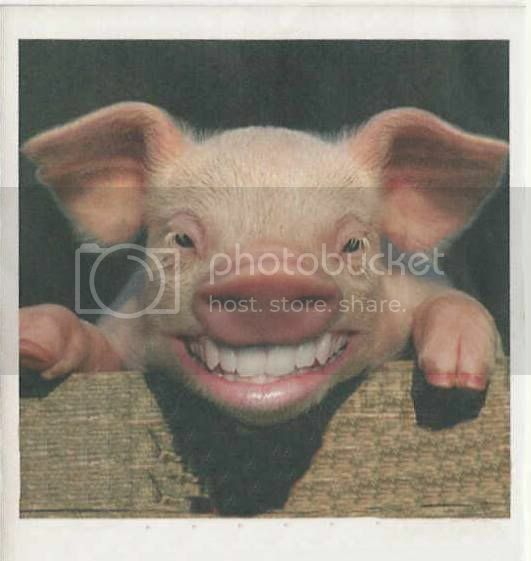 As I hope you can see, what you asserting is completely void of logic, I might even call it trolling. Lisa0315 Respect Catholics and the Mother Church! So, what kind of crap is this??? My co-worker lost a family member in that plane. I want to know why someone dares to start a thread like this! In other words, to question is bad. No, questioning is not bad, but I suppose body parts of victims identified by DNA is not enough evidence? Note: I believe Marchlewis is happy for me to include comments from our recent PM conversation. If I am wrong then please send me the PM right away and I will edit those comments out of this post. TY. Anyway Im having trouble finding certain numbers I need. You seem to have a great deal of information so I was wondering if you have these numbers specifically. The empty weight of the aircraft. I have the max takeoff already. 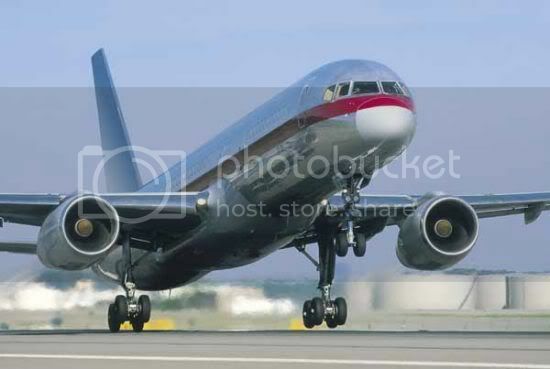 The right weight for the 757-200 Jetliner is 100 tons. You do not want an empty weight, because AA77 was supposed to be flying with a regular passenger/fuel load. AA77 is &#8216;supposed&#8217; to have had 5,300 gal (36,200 lbs) of fuel (http://killtown.911review.org/chart.html) with the Engine Model: RB211-535E4B. Operating empty with P&W engines 57,840kg (127,520lb), with RB211s 57,975kg (127,810lb). You are looking at an empty weight of 128,000 pounds and a maximum takeoff weight of 255,000 pounds, so the right answer for your equation is still right at 200,000 pounds. Use this round number in your calculation, so that the answer tells us the energy released in a real operating 757-200 Jetliner and not one just off the assembly line with no fuel, cargo, passengers and crew aboard. The amount of fuel on board the plane when it took off. 2/3rds full? 1/2?. This one is most critical as almost all the energy in the collision will come from the fuel. Remember that Jet fuel is only kerosene. http://en.wikipedia.org/wiki/Jet_fuel The flash point of kerosene is only 100.4 degrees F with an autoignition temperature at 410 degrees F. The Open Air burning Temperature is only 549.5 degrees F. However, the melting point of Titanium is a whopping 3135 degrees F. Obviously this means a mountain of kerosene will not melt one ounce of Titanium in any open air fire. :0) Any kerosene would reach the flash point temperature and vaporize LONG before contributing to the melting of any Titanium in a 100-Ton Jetliner. 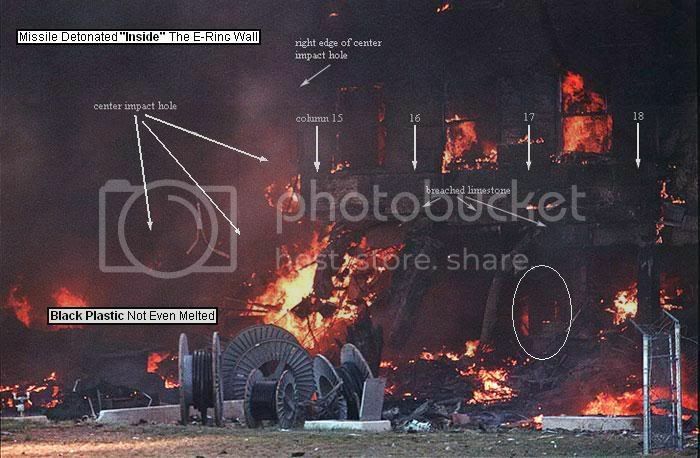 We saw good examples of that in the WTC cases (pic) where these explosions burned off the available kerosene in mere seconds and could NOT have contributed to the melting of any Titanium in the Jetliners or steel in the WTC Towers. There is no energy source coefficient to enter into your equation, except for what is contained in the &#8220;Mass&#8221; itself. :0) Your calculation will prove insufficient evidence for AA77 to simply vaporize into thin air leaving no partially melted titanium that should be present. If you really want to see the reality of the ridiculous nature of the Official Cover Story (people have been DUPED), then ready yourself from some gruesome evidence. If you have a weak stomach, then do not click on this link! Everyone has been warned . . . The first picture shows a male victim from the supposed AA77 crash surrounded by &#8216;not destroyed&#8217; Jetliner debris. Note how the upper torso is burned severely, but the pants of this same victim remained unburned. The evidence says this victim suffered from direct exposure to hydrocarbon-based torching to his upper torso, while the remainder of his body is virtually untouched. 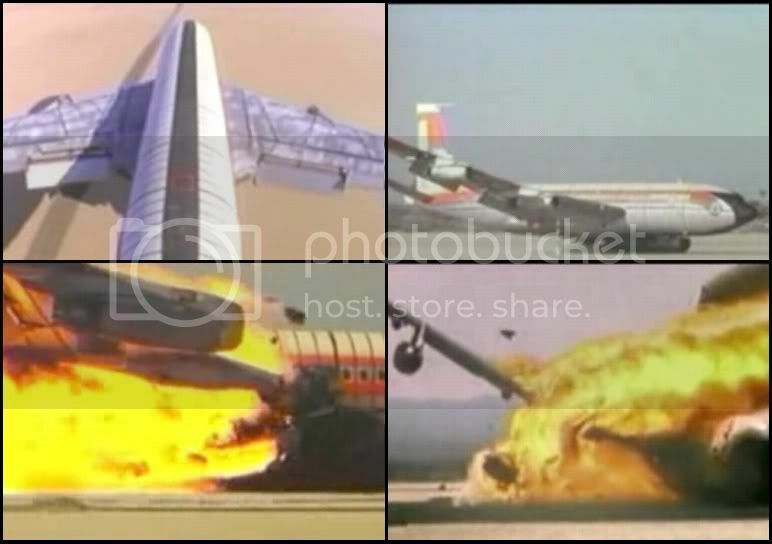 If this Jetliner really crashed going 530 miles per hour, AND even the engines were incinerated out of existence, then how does this victim come out without even one broken bone? This victim is pictured sitting back with both arms on the rests on either side of his seat, which is exactly the way most everyone here has sat during a typical Jetliner flight. So, why is this guy still leaning backwards and not pushed through the front of the vaporizing Jetliner going 530 MPH? Move down to the second picture where the victim has his blue checkered flannel shirt pulled out of his trousers. Then look over and note his oversized black wallet stuffed into his front right-hand pocket, which is also typical of every man taking a trip across the country on any typical Jetliner. Note again that this body has NOT EVEN ONE BROKEN BONE, but somehow we are expected to believe the bodies survived the AA77 Jetliner crash that included the entire Jetliner being &#8220;destroyed.&#8221; This body has obviously been moved to stage this photo op, which is how the unburned blue section of his shirt was pulled out of his pants. At least the real Inside-Job Bad Guys did not pick the man&#8217;s pocket . . . The lesson is that nobody need run any &#8220;AA77 Vaporization&#8221; Calculations, because we have completely intact bodies from victims in the photographs without signs of even one broken bone. How did the engines and 60 tons of titanium simply vaporize into thin air around these intact bodies? :0) That is very much IMPOSSIBLE, because the Official Cover Story is a Loyal Bushie LIE. 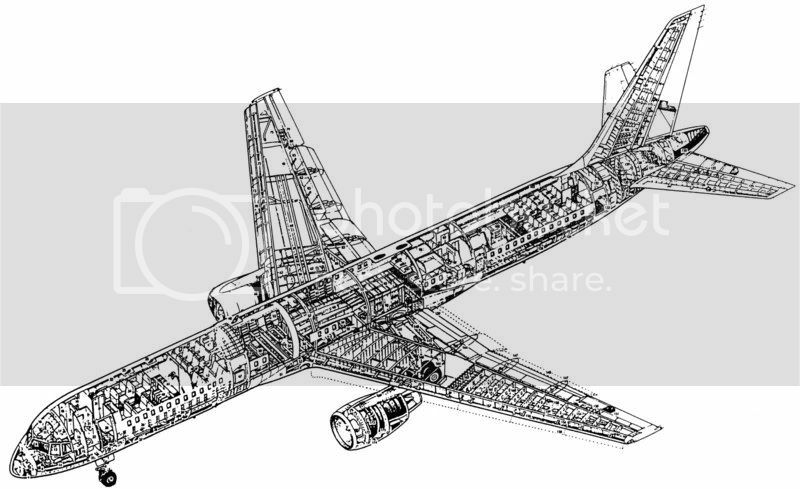 The right weight for the 757-200 Jetliner is 100 tons. You do not want an empty weight, because AA77 was supposed to be flying with a regular passenger/fuel load. AA77 is supposed to have had 5,300 gal (36,200 lbs) of fuel (http://killtown.911review.org/chart.html) with the Engine Model: RB211-535E4B. Operating empty with P&W engines 57,840kg (127,520lb), with RB211s 57,975kg (127,810lb). You are looking at an empty weight of 128,000 pounds and a maximum takeoff weight of 255,000 pounds, so the right answer for your equation is still right at 200,000 pounds. Use this round number in your calculation, so that the answer tells us the energy released in a real operating 757-200 Jetliner and not one just off the assembly line with no fuel, cargo, passengers and crew aboard. Remember that Jet fuel is only kerosene. http://en.wikipedia.org/wiki/Jet_fuel The flash point of kerosene is only 100.4 degrees F with an autoignition temperature at 410 degrees F. The Open Air burning Temperature is only 549.5 degrees F. However, the melting point of Titanium is a whopping 3135 degrees F. Obviously this means a mountain of kerosene will not melt one ounce of Titanium in any open air fire. :0) Any kerosene would reach the flash point temperature and vaporize LONG before contributing to the melting of any Titanium in a 100-Ton Jetliner. 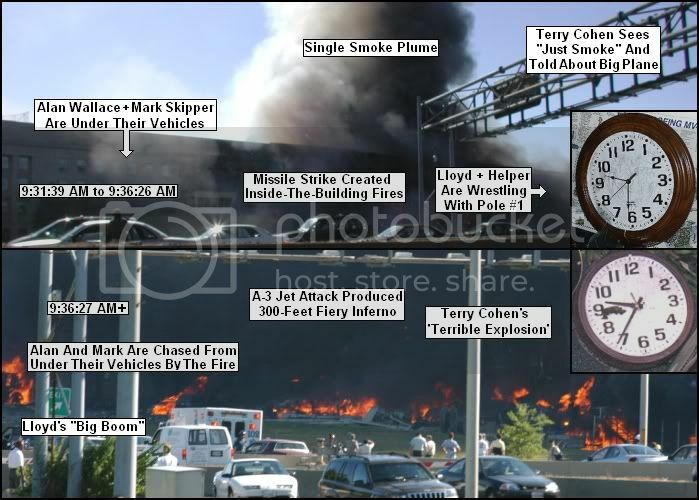 We saw good examples of that in the WTC cases (pic) where these explosions burned off the available kerosene in mere seconds and could NOT have contributed to the melting of any Titanium in the Jetliners or steel in the WTC Towers. There is no energy source coefficient to enter into your equation, except for what is contained in the Mass itself. :0) Your calculation will prove insufficient evidence for AA77 to simply vaporize into thin air leaving no partially melted titanium that should be present. The first picture shows a male victim from the supposed AA77 crash surrounded by not destroyed Jetliner debris. Note how the upper torso is burned severely, but the pants of this same victim remained unburned. The evidence says this victim suffered from direct exposure to hydrocarbon-based torching to his upper torso, while the remainder of his body remained virtually untouched. If this Jetliner really crashed going 530 miles per hour, AND even the engines were incinerated out of existence, then how does this victim come out without even one broken bone? This victim is pictured sitting back with both arms on the rests on either side of his seat, which is exactly the way most everyone here has sat during a typical Jetliner flight. So, why is this guy still leaning backwards and not pushed through the front of the vaporizing Jetliner going 530 MPH? Move down to the second picture where the victim is has his blue checkered flannel shirt pulled out of his trousers. Then look over and note his oversized black wallet stuffed into his front right-hand pocket, which is also typical of every man taking a trip across the country on any typical Jetliner. Note again that this body has NOT EVEN ONE BROKEN BONE, but somehow we are expected to believe the bodies survived the AA77 Jetliner crash that included the entire Jetliner being destroyed. This body has obviously been moved to stage this photo op, which is how the unburned blue section of his shirt was pulled out of his pants. At least the real Inside-Job Bad Guys did not pick the mans pocket . . . The lesson is that nobody need run any AA77 Vaporization Calculations, because we have completely intact bodies from victims in the photographs without signs of even one broken bone. How did the engines and 60 tons of titanium simply vaporize into thin air around these intact bodies? :0) That is very much IMPOSSIBLE, because the Official Cover Story is a Loyal Bushie LIE. How did my co-worker's sister-in-law get inside of the Pentagon then? Many people died on 9/11, but that does not make the Official Cover Story true by any stretch of the imagination. You should be more concerned about seeing the real Inside-Job Terrorists (the real bad guys) brought to justice, than attempting to point fingers at me for telling the 911Truth. Does Lisa have evidence to refute ONE THING in the Opening Post of this thread? No! If she had that kind of evidence, then we would not be suffering through her co-worker statements that add nothing whatsoever to this deliberation process. 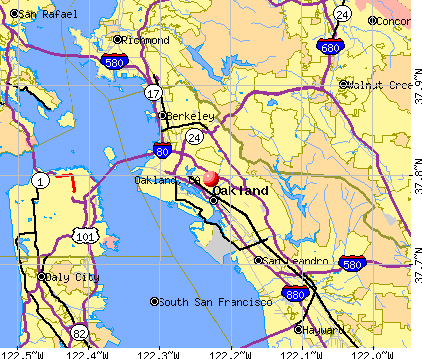 The very next victim in the very next Inside-Job attack (out west in California = Oakland) might very well be you! If you really want to endorse Senor Bushies explanation for these 9/11 attacks (pic), then by all means start hauling out your evidence for AA77 crashing anywhere. "Crap" is exactly what you have presented against my OP hypothesis. GL. How did my co-worker's sister-in-law get inside the Pentagon? Dont get worked up, ignore the troll-tards. Srsly! However, do not even compare them to retarded folks. That is an insult to the sweet mentally handicapped folks out there. These are excellent examples of projection. You say that in every thread where you get owned. Tell us again why dont have to pay taxes because you dont agree that the united states exists? Right. Owned? :0) If you disagree with anything presented in the OP of this thread, then please show us your pictures of AA77 crashed at the Pentagon. The fact is that MANY people are in denial of the 911Truth and would rather believe 100-Ton Jetliners crashed where nothing (FL93) like that ever (Thread) happened. Please head back up to the OP and try to prove one statement wrong. Hmm. I'll concede that my post was a little too short tempered and snappy.